After-market decals may be just what you've been looking for! For a number of reasons. We have thousands of customers, but each buys for his or her own reason. Most of those reasons can but summed up in 5 words below. Just one of these could make us the right choice for you. Price. We get it...Price isn't the only thing you're concerned about. Saving $50.00 or even a few hundred dollars on decals for a machine valued in the tens or hundreds of thousands may be a small matter. But for many people saving money is always a good thing. And why shouldn't it be. If you purchase regularly, those small $50.00 and $100.00 savings, will start to add up. Honestly, it probably won't be the prices that keep you coming back, making you one of our regulars, but most people are never upset about saving money. Availability. We're a great source for machine decals that are no longer available through any OEM supply-source. We can provide decal packages for all those Legacy brands - the ones which have been bought out by another company which no longer chooses to support them. Older equipment for which the OEMs have long since discontinued support. Machine brands which no longer exist. Our extensive digital inventory allows us to produce the decals you need for machines dating back 30, 40, 50 years and more. Yes, your decal is available. Ease of ordering. Have a busy day? Don't want to use it up in looking up individual part numbers for the decals you need? Don't feel like spending time on hold while your local dealer looks up part numbers and provides individual price? Perhaps our simple ordering process is what you're looking for. Simply provide the make, the model, the year and the series of the machine, and we'll know what to provide. Not sure what you need? Send us a few photos and we'll figure it out. 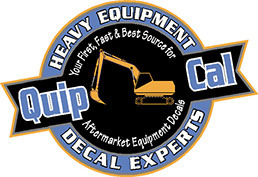 We produce and sell equipment decals, and that's all we do. We don't sell buckets, oil, driveline parts etc. So while we don't know everything about machines, we do know decals quite well. Try us. Convenience. That word can mean many things, but here's what it means to us. We are a single-source supplier. Do you buy and sell multiple brands of machinery? As a contractor or rancher, do you operate multiple brands of machinery. Some purchased from the local dealer, but others picked up at auctions or through private sale? With one call to one source, you can quickly place orders for machine decals for most of the brands you can name and a good many you couldn't even think of. And if we don't have it yet, we'll create it. One call and then on with your day. That means a more stress-free day and maybe a little more time for something fun or productive. Responsiveness. The ability to adapt and flex to meet a customer's needs at a critical time. Let's be honest. No one - and that means us also - loves rush orders. But we do understand that there are times when situations change quickly. The machine that you had 3 weeks to refurb is now due on a new job-site 3 days from now and it's just coming out of the paint shop. You need decals quickly. A customer just drove into your sales yard, saw the machine he needed and wants to take delivery in a week - with fresh paint. You need decals quickly. But responsiveness is more than speed. It's an in-house design team that can create an unusual decal quickly and from a sketch or a photo. It's working to get you what you need, not just what's available off the shelf.